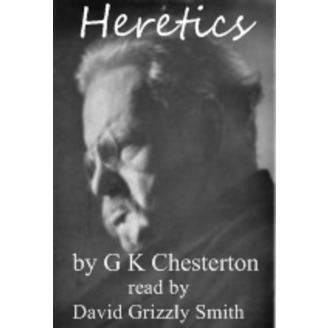 "Heretics," a series of essays by Gilbert Keith Chesterton. First published in 1905. 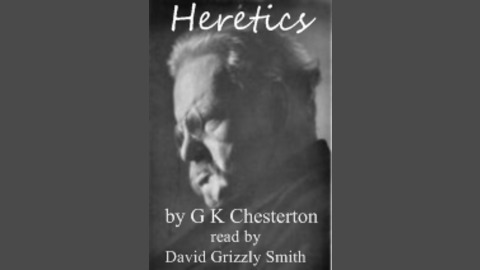 Read by David "Grizzly" Smith. Chesterton had a sense of humor, had a sense of drama, and had sense. He was a man of strong opinions, and quite willing to argue vehemently for his own opinions, even with his friends -- and they remained his friends -- like George Bernard Shaw and Rudyard Kipling. Seems to me that is hard to find anymore. He wrote prolifically. He wrote humor. He wrote mystery novels, the Father Brown mysteries in particular. But he also wrote his opinions, his religious opinions and his opinions about religion. "Heretics" is a book about religion and politics, theory and fact, morals and efficiency. What I most admire about "Heretics," written a bit over a century ago, is that his arguments are exceptional, and that so many of them are still quite recognizably true. He argues that the weakening and devaluing of religion has also weakened and devalued heresy. He argues that people should be able to speak freely -- but that freedom of speech has actually decreased people's willingness to speak about important issues. And so much more. The one disclaimer I feel I must offer is that this book was "timely." Some of the people and events he mentions will be familiar. Many other people and events would have been familiar to you, if you'd lived in England at the beginning of the last century. The ideas he opposes, however, are either regaining popularity, or have never lost it. And his arguments are as valid and wise now as they were. In some ways, he was ahead of his time. You may disagree with him, but you can't deny his intelligence and wisdom. This isn't the book you might expect it to be. I think you'll enjoy it, and maybe even learn something. Even if you disagree. Book Theme: "Thaxted," written by Gustav Holst, arranged by Kevin MacLeod.